It was merely a matter of time before one of the new core-rich titans – the Intel’s 8-core “Beckton” Nehalem-EX (Xeon 7500) or AMD’s 12-core “Magny-Cours” (Opteron 6100) – was to make a name for itself on VMware’s VMmark benchmark. Today, Intel draws first blood in the form of an 4-processor, 32-core, 64-thread, monster from IBM: the x3850 X5 running four Xeon X7560 (2.266GHz – 2.67GHz w/turbo, 130W TDP, each) and 384GB of DDR3-1066 low-power registered DIMMs. Weighing-in at 70.78@48 tiles, the 4P IBM System x3850 handily beats the next highest system – the 48-core DL785 G5 which set the record of 53.73@35 tiles back in August, 2009 – and bests it by over 30%. At $3,800+ per socket for the tested Beckton chip, this is no real 2P alternative. In fact, a pair of Cisco UCS B250 M2 blades will get 52 tiles running for much less money. Looking at processor and memory configurations alone, this is a $67K+ enterprise server, resulting in a moderately-high $232/VM price point for the IBM x3850 X5. SOLORI’s Take: The most interesting aspect of the EX benchmark is its clock-adjusted scaling factor: between 70% and 91% versus a 2P/8-core Nehalem-EP reference (Cisco UCS, B200 M1, 25.06@17 tiles). The unpredictable nature of Intel’s “turbo” feature – varying with thermal loads and per-core conditions – makes an exact clock-for-clock comparison difficult. However, if the scaling factor is 90%, the EX blows away our previous expectations about the platform’s scalability. Where did we go wrong when we predicted a conservative 44@39 tiles? We’re looking at three things: (1) a bad assumption about the effectiveness of “turbo” in the EP VMmark case (setting Ref_EP_Clock to 3.33 GHz), and (2) underestimating EX’s scaling efficiency (assumed 70%), (3) assuming a 2.26GHz clock for EX. This give us a good basis for evaluating 2P vs. 4P Nehalem systems: scaling factor of 71% and capable of pushing clock towards the 3GHz mark within its thermal envelope. Both of these conclusions fit typical 2P-to-4P norms and Intel’s process history. That’s nowhere near good enough to top the current 8P, 48-core Istanbul VMmark at 53.73@35 tiles, so we’ll likely have to wait for faster 6100 parts to see any new AMD records. However, assuming AMD’s proposition is still “value 4P” so about 200 VM’s at under $18K/server gets you around $90/VM or less. 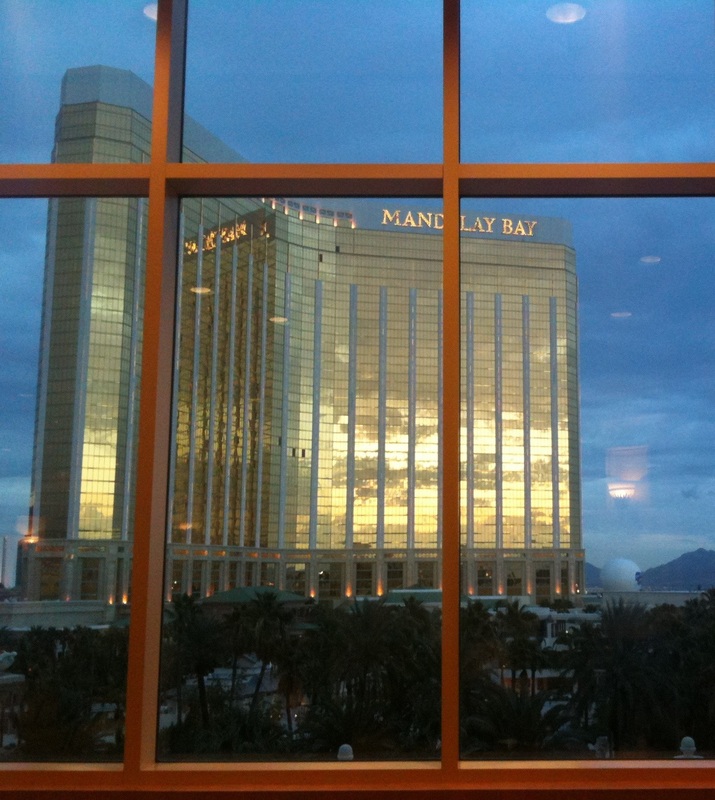 It’s my second day at the beautiful Mandalay Bay in Las Vegas, Nevada and VMware PartnerExchange 2010. Yesterday was filled with travel and a generous “Tailgate Party” with burgers, dogs, beverages and lots of VMware geeks! I managed to catch the last quarter of the game from the Mandalay Bay Poker Room where I added to my chip stack at the 1/2 No-Limit Texas Hold ‘Em tables. Then it was early to bed – about 9PM PST – where I studied for the upcoming VCP410 exam. 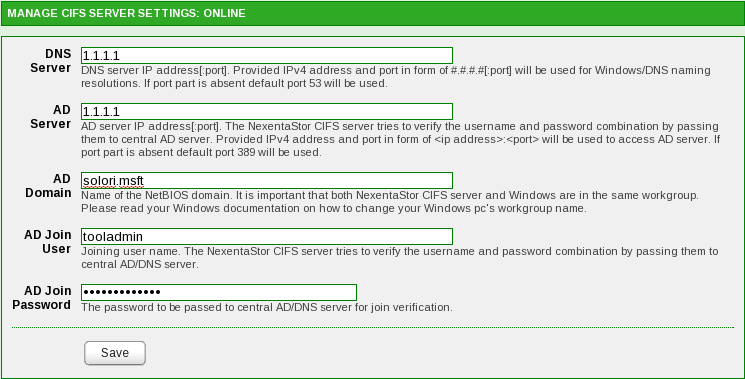 What is the maximum number of vNetwork switch ports per ESX host and vCenter Server instance? Following the VCP4 Prep Course, I “recharged” in the Alumni Lounge. VMware had snacks and drinks to quell the appetite and lots of power outlets to restore my iPhone and laptop. While I waited, I contacted the wife and got the 4-1-1 on our baby, checked e-mail and ran through the “mock-up” exam a couple of times. Then it was off to the Welcome Reception at the VMware Experience Hall where sponsors and exhibitors had their wares on display. Just inside the Hall – across from the closest beverage station – was Intel’s booth and the boys in blue were demonstrating vMotion over 10GE NICs. Yes, it was fast (as you’d expect) but the real kick was the “upcoming” 10GE Base-T adapters to challenge the current price-performance leader: the 10GE Base-CR (also supporting SFP+). At under $400/port for 10GE, it’s hard to remember a reason for using 1Gbps NICs… Oh yes, the prohibitive per-port cost of 10GE switches. AristaNetworks to the rescue??? Intel was also showing their “modular server” system. Unfortunately, the current offering doesn’t allow for SAS JBOD expansion in a meaningful way (read: running NexentaStor on one/two of the “blades”), but after discussing the issue of SAS/love with the guys in the blue booth, interests were peaked. Evan, expect a call from Intel’s server group… Seriously, with 14x 2.5″ drives in a SAS Expander interconnected chassis, NexentaStor + SSD + 15K SAS would rock! Last but not least, Intel was proudly showing their 4P, Nehalem-EX running VMware ESX with 512GB of RAM (DDR3) and demonstrating 64active threads (pictured.) 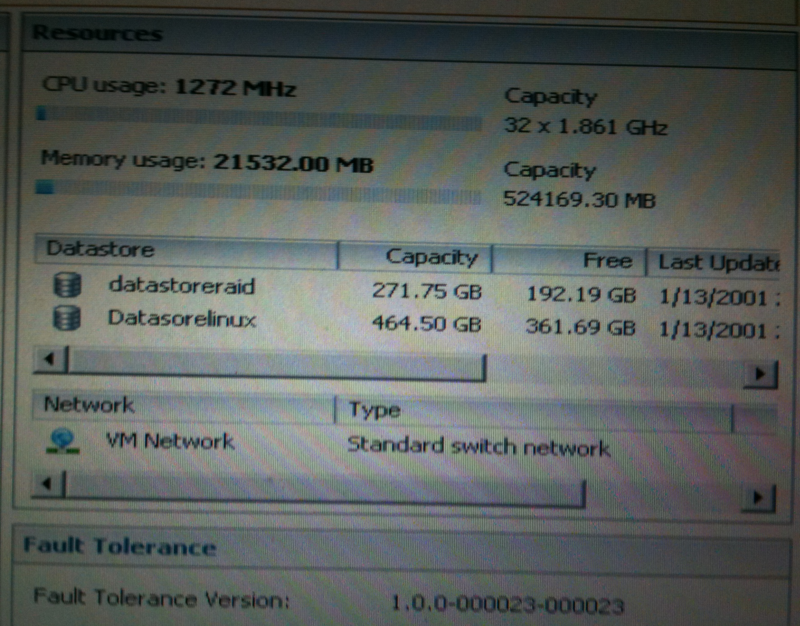 This build-out offers lots of virtualization goodness at a hereto unknown price point. Suffice to say, at 1.8GHz it’s not a screamer, but the RAS features are headed in the right direction. When you rope 64-threads (about 125-250 VM’s) and 1TB worth of VM’s (yes, 1TB RAM – about $250K worth using “on-loan Samsung parts”) you are talking about a lot of “eggy in the basket.” By enhancing the RAS capabilities of these giant systems, component failure mitigation is becoming less catastrophic – eventually allowing only a few VM’s to be impacted by a point failure instead of ALL running VM’s on the box. 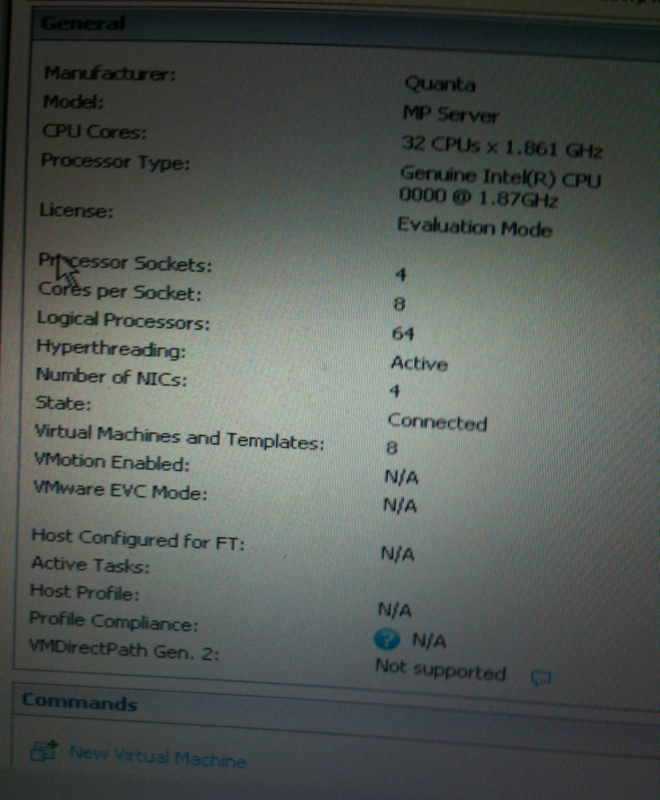 In case you haven’t seen an ESX host with 512GB of available RAM, check-out this screen capture (excuse the iPhone quality) to the right. That’s about $33K worth of DDR3 memory sitting in that box and assuming that the EX processors run $2K a piece and giving $6K for the remainder of the system, that’s nearly $6K/VM in this demo: fantastically decadent! Of course – and in all due fairness to the boys in blue – VM density was not the goal in this demonstration: RAS was, and the 2-bit error scrubbing – while painful as watching paint dry – is pretty cool and soon to be needed (as indicated above) for systems with this capacity. Other vendors visited were Wyse and Xsigo. The boys in yellow (Wyse) were pimping their thin/zero clients with some compelling examples of PCoIP (Wyse 20p) and MMR (Wyse r90lew). The PCoIP demos featured end-to-end hardware Teradici cards displaying clips from Avatar, while the MMR demo featured 720p movie clips from an iMAX cut of dog fight training. While the PCoIP was impressive and flawless, the upcoming MMR enhancements – while flawed in the beta I saw – were nothing short of impressive. 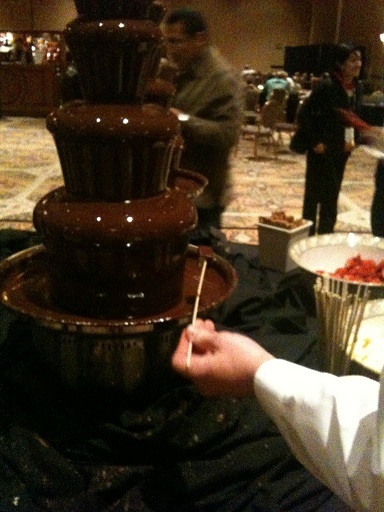 No, that's not Xsigo's secret sauce: it's the chocolate fountain at VMware's Welcome Reception. Andreas Galistel at NordicHardware posted an article showing a system running a pair of engineering samples of the Magny-Cours processor running at 3.0GHz. Undoubtedly these images were culled from a report “leaked” on XtremeSystems forums showing a “DINAR2” motherboard with SR5690 chipset – in single and dual processor installation – running Magny-Cours at the more typical pre-release speed of 1.7GHz. We know that Magny-Cours is essentially a MCM of Istanbul delivered in the rectangular socket G34 package. One thing illuminating about the two posts is the reported “reduction” in L3 cache from 12MB (6MB x 2 in MCM) to 10MB (2 x 5MB in MCM). Where did the additional cache go? That ‘s easy: since a 2P Magny-Cours installation is essentially a 4P Istanbul configuration, these processors have the new HT Assist feature enabled – giving 1MB of cache from each chip in the MCM to HT Assist. Another thing intriguing about the XtremeSystems post in particular is the reported wPrime 32M and 1024M completion times. Compared to the hyper-threading-enabled 2P Xeon W5590 (130W TDP) running wPrime 32M at 3.33GHz (3.6GHz turbo) in 3.950 seconds, the 2P 3.0GHz Magny-Cours completed wPrime 32M in an unofficial 3.539 seconds – about 10% quicker while running a 10% slower clock. From the myopic lens of this result, it would appear AMD’s choice of “real cores” versus hyper-threading delivers its punch. SOLORI’s Take: As a “reality check” we can compared the reigning quad-socked, quad-core Opteron 8393 SE result in wPrime 32M and wPrime 1024M at 3.90 and 89.52 seconds, respectively. Adjusted for clock and core count versus its Shanghai cousin, the Magny-Cours engineering samples – at 3.54 and 75.77 seconds, respectively – turned-in times about 10% slower than our calculus predicted. While still “record breaking” for 2P systems, we expected the Magny-Cours/Istanbul cores to out-perform Shanghai clock-per-clock – even at this stage of the game. Looking at the more “typical” engineering sample speed tests posted on the XtremeSystems’ forum tracks with the 3.0GHz overclock results at a more “typical” clock speed of 2.6GHz for 2P Magny-Cours: 3.947 seconds and 79.625 seconds for wPrime 32M and 1024M, respectively. Even at that speed, the 24-core system is on par with the 2P Nehalem system clocked nearly a GHz faster. Oddly, Intel reports the W5590 as not supporting “turbo” or hyper-threading although it is clear that Intel’s marketing is incorrect based on actual testing. Assuming Magny-Cours improves slightly on its way to market, we already know how 24-core Istanbul stacks-up against 16-thread Nehalem in VMmark and what that means for Nehalem-EP. This partly explains the marketing shift as Intel tries to position Nehalep-EP as a destined for workstations instead of servers. Whether or not you consider this move a prelude to the ensuing Nehalem-EX v. Magny-Cours combat to come or an attempt to keep Intel’s server chip power average down by eliminating the 130W+ parts from the “server” list, Intel and AMD will each attempt win the war before the first shot is fired. Either way, we see nothing that disrupts the price-performance and power-performance comparison models that dominate the server markets. Not satisfied with a landmark VMmark score that crossed the 30 tile mark for the first time, HP’s performance team went back to the benches two weeks later and took another swing at the performance crown. Well, the effort paid off, and HP significantly out-paced their two-week-old record with a score of 53.73@35 tiles in the heavy weight, 48-core category. Using the same 8-processor HP ProLiant DL785 G6 platform as in the previous run – complete with 2.8GHz AMD Opteron 8439 SE 6-core chips and 256GB DDR2/667 – the new score comes with significant performance bumps in the javaserver, mailserver and database results achieved by the same system configuration as the previous attempt – including the same ESX 4.0 version (164009). So what changed to add an additional 5 tiles to the team’s run? It would appear that someone was unsatisfied with the storage configuration on the mailserver run. Given that the tile ratio of the previous run ran about 6% higher than its 24-core counterpart, there may have been a small indication that untapped capacity was available. 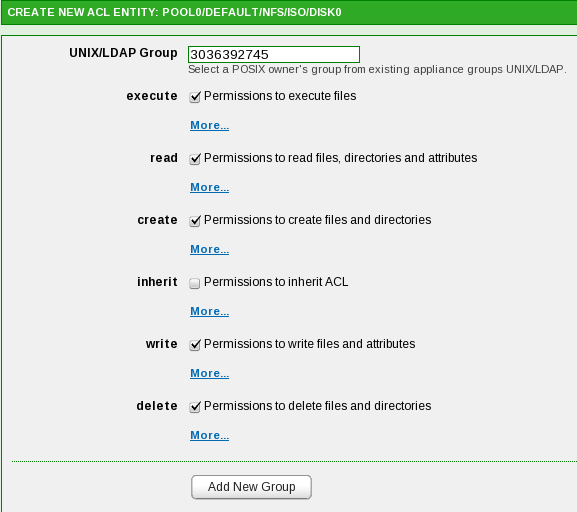 According to the run notes, the only reported changes to the test configuration – aside from the addition of the 5 LUNs and 5 clients needed to support the 5 additional tiles – was a notation indicating that the “data drive and backup drive for all mailserver VMs” we repartitioned using AutoPart v1.6. The change in performance numbers effectively reduces the virtualization cost of the system by 15% to about $257/VM – closing-in on its 24-core sibling to within $10/VM and stretching-out its lead over “Dunnington” rivals to about $85/VM. While virtualization is not the primary application for 8P systems, this demonstrates that 48-core virtualization is definitely viable. SOLORI’s Take: HP’s performance team has done a great job tuning its flagship AMD platform, demonstrating that platform performance is not just related to hertz or core-count but requires balanced tuning and performance all around. This improvement in system tuning demonstrates an 18% increase in incremental scalability – approaching within 3% of the 12-core to 24-core scaling factor, making it actually a viable consideration in the virtualization use case. In recent discussions with AMD about the SR5690 chipset applications for Socket-F, AMD re-iterated that the mainstream focus for SR5690 has been Magny-Cours and the Q1/2010 launch. Given the close relationship between Istanbul and Magny-Cours – detailed nicely by Charlie Demerjian at Semi-Accurate – the bar is clearly fixed for 2P and 4P virtualization systems designed around these chips. Extrapolating from the similarities and improvements to I/O and memory bandwidth, we expect to see 2P VMmarks besting 32@23 and 4P scores over 54@39 from HP, AMD and Magny-Cours. SOLORI’s 2nd Take: Intel has been plugging away with its Nehalem-EX for 8-way systems and – delivering 128-threads – promises to deliver some insane VMmarks. Assuming Intel’s EX scales as efficiently as AMD’s new Opterons have, extrapolations indicate performance for the 4P, 64-thread Nehalem-EX shoud fall between 41@29 and 44@31 given the current crop of speed and performance bins. Using the same methods, our calculus predicts an 8P, 128-thread EX system should deliver scores between 64@45 and 74@52. With EX expected to clock at 2.66GHz with 140W TDP and AMD’s MCM-based Magny-Cours doing well to hit 130W ACP in the same speed bins, CIO’s balancing power and performance considerations will need to break-out the spreadsheets to determine the winners here. With both systems running 4-channel DDR3, there will be no power or price advantage given on either side to memory differences: relative price-performance and power consumption of the CPU’s will be major factors. Assuming our extrapolations are correct, we’re looking at a slight edge to AMD in performance-per-watt in the 2P segment, and a significant advantage in the 4P segment.